My friend, Lynn Terry from Low Carb Traveler (follow her on Facebook and Twitter), recently bought these Northside Women’s Burke II Sandals from Amazon and had raving reviews. Above you can see Lynn wearing her new shoes with Fabletics athletic wear. I asked if I could share her comments (minus all the smiley emoticons)! Look what I got this weekend. (In Black/Lilac) I love them!! I think they’ll go great with that new dress… haha. Seriously, best shoes I’ve put on my foot in years!! Great for hiking, creek wading, all kinds of fun summer adventures. I fell IN LOVE with it the minute I put it on my foot. I would normally get an 8.5 in a sneaker, but an 8 was perfect in this one. They feel very supportive on my feet. I just fell in love with the way they felt – very cushy, very comfy, roomy in the toe area (no toe pinching, which I really dislike! ), etc. I like that they look just like Keen shoes, but are way less expensive! The reviews also touts them as “water shoes” which I’m sure are way more comfortable than the cheap aqua socks that I usually wear on the river (my kids always called them “tacos” for some reason). Get a leg up on these go-everywhere, protective Northside Burke II Water Sandals. They’re as comfortable in the water as they are on land. For cabin, camping, boating, in the sun, on the lake and multiple outdoor activities during the summer months. Keeps feet shielded from jagged shells, sharp rocks and debris often not seen below the surface. These Northside Burke II Water Shoes are available in an array of color choices, so click here to see if they have your size in stock! 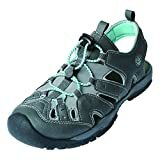 You can find Northside Burke II Water Sandals for the best price on Amazon.